There’s no element of uncertainty when making a David Lebovitz recipe. They’re all perfect, and his Salted Butter Chocolate Chip Cookies recipe is no exception. The cookies are rich, chewy, and have a strong brown sugar flavor. 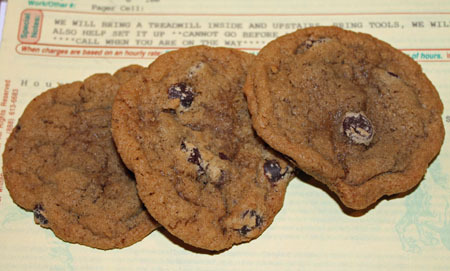 Here’s the cookie recipe from David Lebovitz’s blog. I’ve made these twice, both times with Plugra. Oh my! I’m hooked. I’m not sure if it’s the recipe or the Plugra, but these are amazing. Thanks Anna! The treadmill looks awesome. And very affordable! I’m glad you’re enjoying it. I’ve had this recipe in my cc cookie “to do” file since last summer. I think it’s time to pull it out. 🙂 And, I’m glad you like the new treadmill. You might also like Coach Rylan. Here’s an example of his programs. http://gosleevelessblog.com/?p=878 He makes the workout count by having concise exercises that work on more than one thing at a time. And, you don’t have to follow along with him, but only watch a short video to see what you are to do. I usually workout at the fitness center, but he gives options for doing the stuff at home with minimal equipment. I baked the cookies tonight after they chilled most of the day. They are a great cookie. I didn’t use salted butter, so I added the extra. I also sprinkled a little sea salt on top just for kicks. I did the spatula slapping with a few from the first baking sheet, but decided it wasn’t really necessary. I’ve got to go look at your treadmill. Thanks for all the comments! I’m just going to answer the ones with questions, but hello to everyone. I’m always happy when people get as excited about chocolate chip cookies as I do. Julie, the cookies got a lot firmer on day 2. They weren’t exactly hard, but they definitely weren’t as good as Day 1. I usually bake the dough up fresh anyway. http://reviews.livestrongfitness.com/0542/ls10-0t/reviews.htm. I wanted the Sole because it was the top rated, but this one was about $400 less, had personal reviews that seemed even better than the Sole, and had all the features that I needed (weight support, big enough belt, enough speed). We’ll see how it holds up. Mary, I totally know what you mean about adding the salt. I think we have control issues. Seriously, it’s probably a good ratio of ingredients using whatever type butter. He made some good points in the post, though. Sue, I know you love DL recipes. As for the confusion about swapping salt amounts, I just glanced over that part because I knew right away I was going to just buy salted butter and go with the original recipe. Was it just me or did anyone else find David’s recipe a little confusing? Maybe I’m tired, but I had a difficult time following swapping out one kind of butter for another and the amounts of salt to swap. At any rate… The few recipes of his that I’ve tried have been excellent. No doubt if I were actually making the cookies it would all become clear to me. Both yours and his look positively scrumptious and I’m salivating thinking of the rich brown sugar, chocolate and lovely hit of salt. Love salt! It enhances flavors so well!!! Will try these cookies soon!!! Gotta go get some Kosher salt. Experimenting with banana blueberry brownies tonight-wish me luck! You got me. The dough is chilling. 😉 I didn’t have salted butter, so I used his idea of adding extra salt, I used a heaping 1/4 t. sea salt. How long did you chill the dough? Not sure I want to wait from now until morning. May just wait until later tonight. I just read David’s post and all the comments…yes, interesting. Did yours harden at all by the next day? A lot of people seemed to have that problem, but of course, that could be for any number of reasons! I’m jealous of your new treadmill! When I have the space, I’m getting one. What model did you get? I love David Lebovitz’s recipes. His blog is also a good read. I’ve never read the spatula trick, so I’m interested in trying that. Like LimeCake, I always use salted butter for baking. With only two people in our family, two types of butter would probably lose freshness, so salted it is. This recipe looks perfect and I will give it a try. I almost always make chocolate chip cookies with salted butter. I love the savouriness they give to the cookie. Have fun with your new treadmill!